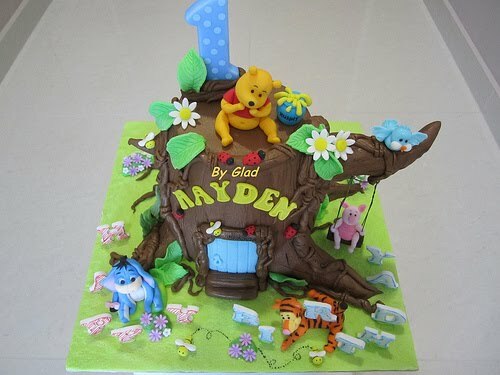 Sometime back in August last year, Hayden's (also Vanessa's) mom contacted me and asked me to make a cake for her baby Hayden's first birthday. 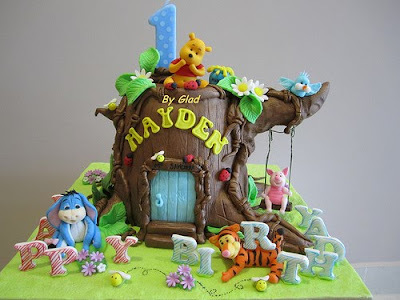 Knowing she is an easy going lady and without much request on the design (after the experience I had when I made her older child Vanessa's cake, click link here to view the cake.... http://gladcake.blogspot.com/2009/07/vanessas-pm-with-farm-animals.html), I actually propose to her (when she sent the numeric 1 candle to me this month) that I am thinking of carving the cake into 3D tree stump shaped using same amount of cake batter for 8" cake.... as expected she is fine with it (see that is what I say she's an easy going lady, hehe). Though it requires more time to carve the cake and more fondant needed, overall I am happy how the cake turns out especially when she told me she likes it (she has no idea how the overall design will look like until the cake is done - since she left the design to me). I was really stress when I carry the cake downstairs as the swing keeps moving non-stop (was afraid that it may drop.... stress, on second thought, should I make the swing to really move next time....). awesome! speechless at your creativity! oh my! this cake is beautiful! i am in awe!